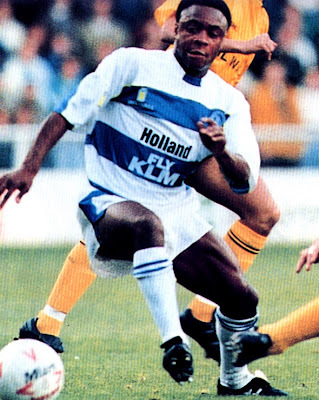 QPR's 14-year association with Adidas ended in 1989 with Influence taking over as the kit supplier, launching three new designs at £19.99 for an adult shirt. Retaining our Dutch sponsors for a final season, the Influence shirts were the first of the 'baggy' type getting more common in football. Home replica shirt with the sponsors straddling the hoops, and the badge with a blue background instead of white. Not exactly sought after but a bit unique. 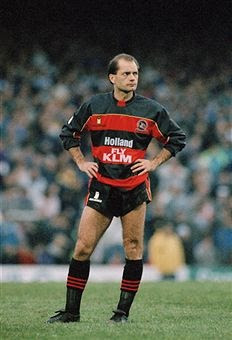 The Influence version of the red and black hoops was the first new away design since 1983 and one of the best versions. Extremely rare player issue shirt. Note 'Fly' replaced with the KLM logo. No pictorial evidence exists as to when this version was actually used. The orange third shirt was never used in a competitive match, though still regularly pops up on ebay as they were readily available to buy at the time, and sold quite high numbers. This is a rare long-sleeved player issue shirt. 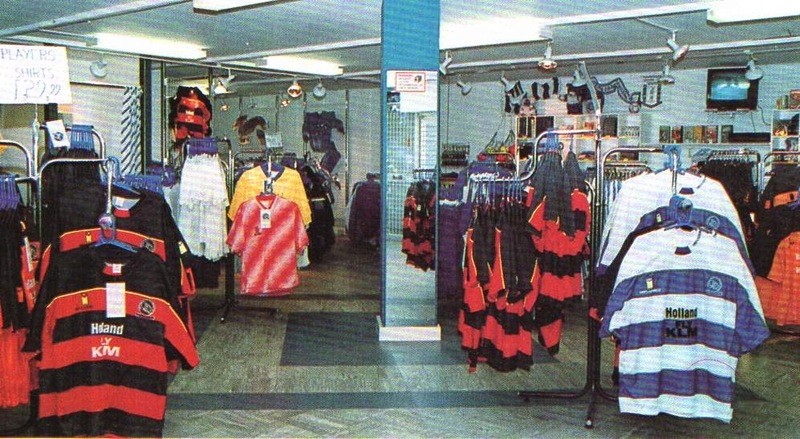 The club shop had all three shirts readily available, although the home shirts had the sponsors logo in all-black, compared to black & white for player shirts. My friend, send my an qpr away shirt, in 1990 when he was working in London. Always thought it was a replica, but now as I have seen the picture with the Extremely rare player issue shirt. I start to wonder ? My shirt is identical, also with the crown in the sponsor logo. It has number 9 on the back. Only difference is that the badge is stitched, with black letters on red background, instead of whit on black background. Any thoughts ? if it has the crown then it is definitely a player-issue shirt, can't confirm if ever worn though. 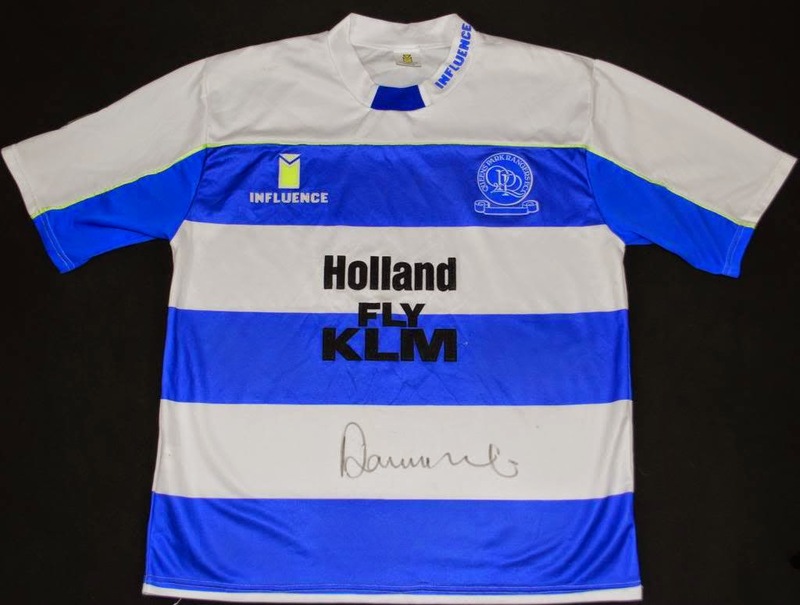 The initial run of replica home shirts were produced with the sponsors 'Fly KLM logo in white and no logo on the collar - I have one! 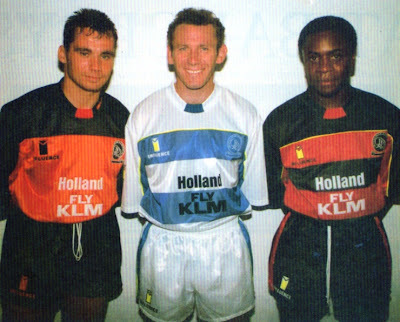 Later they began to appear with the sponsors 'Fly KLM' logo in black and the 'Influence' on the collar. 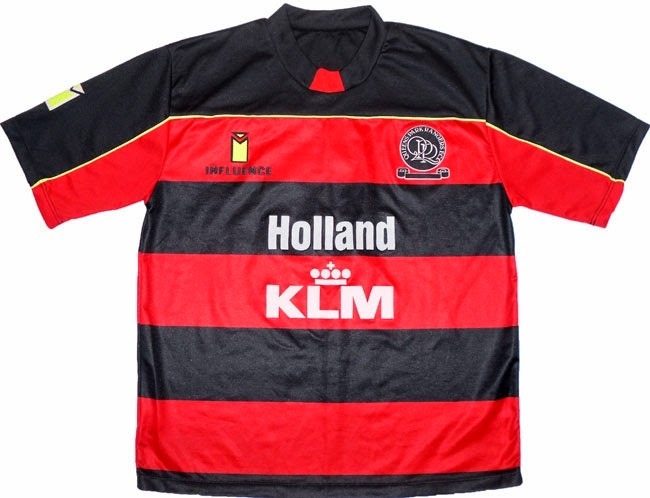 At the time I was in a 5-a-side team made up of Rangers boys and we ordered the black and red away kit as our own. It was made for us especially with the breast Influence 'I' embroidered (not ironed on as the replicas) as per the players versions, but with no other badges. We added the name of the pub across the belly, the logo of the brewery in place of the club badge, and the brewers name 'Benskins' across the rear shoulders, above a number. Players quality material and shirt, I still have mine.